Will you be remembered as a great wizard? Imagine for a moment that you were a crazy drunkard and a simpleton living in the mid 500’s A.D. How do you suppose you might be remembered, a millenium and a half later? You never know: you could be remembered as the greatest wizard of all time. Suppose your name was Myrddin Wyllt. You are Welsh, and poor, so your family is unable to buy you any vowels. You make a living singing for the family of the local chieftain, Lord Gwenddoleu. (As you can tell, Gwenddoleu was wealthy and could therefore afford many vowels.) The Lord’s family takes care of you, because you are a little slow and a little crazy. It’s possible you are schizophrenic, although naturally you were not diagnosed as such at the time. But you are kept around for entertainment, and they give you mead, and you lead a fairly peaceful existence. Until one day Riderch Hael, King of Alt Clut, comes along and slaughters everybody in town. He mainly does this because he is a Christian and you and all of your fellow townspeople are pagans. You escape into the Caledonian Forest, and turn completely and utterly barking raving mad. You talk to animals, you run naked through the forest, you live in a cave. You are very, very hairy. But these are superstitious times, and the people in the surrounding villages have some ambivalence toward your madness. On the one hand, they make fun of you. On the other hand, there are whispers that you may speak to demons. Or perhaps to angels. You might tell the future, or people’s fortunes. Who knows what wisdom might be hidden in your incomprehensible mutterings? So people come to you and ask you questions. The fact is, you’re simple and insane, but you like the attention… so you will talk to people who approach you peacefully. But you ramble at them. You are not coherent. The people you speak with walk away feeling either enlightened or perplexed or, most likely, both. One day, some young shepherds are mocking you and teasing you, and they chase you through the forest. They start to get mean, as packs of young men sometimes do, and you trip and fall down a cliff and into a stream, where your body is impaled on a fisherman’s stake. The next morning, after the body is found, the stories begin to circulate around the village. Since it was a small medieval town and there was not much else to do, stories and rumors flew in a whirlwind. Soon, everyone wanted to get in on the action. One traveler knew some stories of a similar figure, a wild and crazy mystic named Lailoken from a far-off village, so he started telling these stories as if they were about you, instead. The ploy worked: this man became very popular, and the center of attention at all of the bars while he told the stories of your impressive fortune-telling. You were, quite literally, the talk of the town for a long time to come. Geoffrey of Monmouth is writing a book. That is far too humble of a task for the mission on which this man has embarked. Geoffrey is creating a national identity for Britain! Now, everybody knows that when you are writing the Truth (with a capital T), the kind of story that is meant to inspire patriotism and pride and a sense of cultural unity, then sometimes it is necessary to embellish a little bit on the truth (lower-case t) if you want to get your point across. So this is what Geoffrey did. He wrote a tale of the lineage of the Kings of Britain, up to and including King Arthur. As most authors know, to have a compelling narrative it helps to have very detailed characters, conflicts, and plot twists. So when it came time to talk about King Arthur and his miraculous reign, it was important to have the most vivid cast of characters around him. To accomplish this, he created a character that was based partly on Emrys Wledig, a war hero who lived in the fifth century, and partially on… you. Yes, you, my dear Myrddin. Isn’t that grand? You see, he had heard some of the tales and folklore of this crazy and wild, possibly possessed, mystic who could foretell the future, and thought: that would be a great person to have at King Arthur’s side! So he wove you into the story. Of course, he had to change a bunch of stuff. For example, remember that Geoffrey is writing after the Normon Conquest in 1066. So one of the common languages being spoken in Britain at the time was Anglo-Norman French. Since uppity French speakers would never be able to deal with a Welsh name like “Myrddin”, which by-the-by also sounds suspiciously like “Merde”, he decided to call you “Merlin” instead. 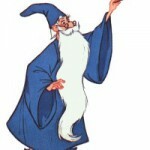 Merlin Emrys, a great and wild seer who aided King Arthur. Over the next few hundred years, these stories of Geoffrey’s really caught on. I mean, I’m talking “Fifty Shades of Grey” and “Twilight” levels of popularity. Dozens, if not hundreds, of fragmentary tales by different authors sprung up using King Arthur and Merlin (and the rest of the Camelot Crew) as characters. Now, keep in mind that people figured out early on that Geoffrey’s dramatic history was more drama than history, but hey… they didn’t care. It was great storytelling. And good story-telling it was! You know how rumors work, right? Each time a tale is re-told it gets amplified a little more. So under the name of “Merlin”, your deeds grew ever more varied and impressive. You can shape-shift. You built Stonehenge. You advised Julius Caeser about his dreams. You appeared as an 18 foot giant with backwards hands. Fast forward 500 more years. The renaissance! Also called a time of revival and rediscovery: the driving force of most intellectual work during the 1500’s to the 1700’s was the desire to uncover truths from the past. Philosophers harkened back to the Greeks. Theologians harkened back to the gospels and texts from the earliest days of Christianity. Magicians tried to uncover writings from Egyptian antiquity. So when many people found writings from the 1100’s about a miraculous magus who lived in the 500’s, they didn’t even break stride to ask questions.! They were overjoyed at the find! This is the truth! This is history! And we have ancient documents to prove it. During this period many people (not all) took the stories about you at face-value, and wrote treatises and plays and essays about you, all very earnestly. 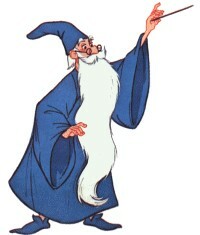 They were seeking to learn about this amazing historical figure, Merlin, the greatest wizard of all time. Of course, by the 1800’s people began to be skeptical again. Skeptical about magic in general, and skeptical about you in particular. But you still are remembered as a history-altering character who literally helped to forge a national identity for hundreds of years. Fast forward that last 200 years, to today. Children’s stories. Television shows. Moving post-modern dramas. All have been written with you as the inspiration. This is what you have become. Which is ironic, because all that you really were was a crazy, dim-witted drunk in Welsh town who ended up living in a cave and drowning in a stream. Anyone who studies these myths will tell you that there are plenty of alternative theories to go around. It might have been exactly as I described above, and it might not. There is absolutely no way that anyone will ever know for sure. The point is that even a drunk crazy homeless person can change the world for thousands of years, when the circumstances are right for it.